Microsoft previewed the next version of its operating system, codenamed Windows 8 for now, both at the D9 conference, and at the Computex 2011 expo in Taiwan, as promised. We were more interested in the tablet user interface of Windows 8, but it turned out that there really won't be much distinction, because the new Live tile-based interface in the Metro UI style of Windows Phone 7 will seemingly be as standard for server PCs, as for the smallest slate. Notice how Microsoft directly talks about apps, not programs, and HTML5 ones that you run directly in the browser? Sign of the times. Speaking of compatibility, you'll be able to run each and every program made for Windows despite the dazzling interface, but only on x86-based chipsets, like Intel or AMD. On ARM-based processors, Windows 8 will most likely only include support for apps that are made for it from the ground-up, since emulating would be a hurdle. ARM-based devices, including a notebook running NVIDIA's quad-core Kal-El chipset, were demonstrated running Win 8. Deeper details about the OS should be disclosed mid-September, at the BUILD conference. With that out of the way, Windows 8 will be the biggest revamp since Win 95: "The user interface and new apps will work with or without a keyboard and mouse on a broad range of screen sizes and pixel densities, from small slates to laptops, desktops, all-in-ones, and even classroom-sized displays. ", says Microsoft. With that said, Redmond is placing restrictions on the type of hardware to run the new operating system. Since touch will be deeply integrated now, not a layer, there are some requirements towards touchscreens - at minimum they should have 1024x768 pixels of resolution, with the best starting point being 1366x768. Redmond also noted the instant-on feature, which hibernates the operating system immediately and then seamlessly fires it back up, just as we would expect on a tablet. Cold boot should take about six seconds with SSD. Upon installing, Windows 8 recognizes the underlying hardware, and scale accordingly, including that Live tile-based, adjustable interface. 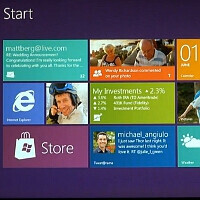 Have a look at what's in store with Windows 8 in the video below. It all looks very shmancy fancy but i think If it wants overtake ios and andriod it needs to be a bit less shmancy fancy and more productive. But its still awsome. What will get it going is office on tablets! We don't know how productive it will be just yet..... But if it'll run ALL of the same programs as Windows 7....I dont know how much more productive you want it to be? Windows Phone 7 is the worse interface for a tablet some of the tiles are way to big & use to much of the interface, on the touch interface where are the gadgets. Looks amazing. Thats all I can say. BUT how will it be on normal Keyboard and Mouse laptops? I will try it out before getting it. Wow this actually looks really impressive. This is a huge step in the right direction for the windows os. If this can be used on a tablet as they stated then I think it is the tablet to beat. At least for me having the full version of Microsoft office on a tablet would be a HUGE deal for me. A very well thought out office suite is something I feel android is sorely missing. its big, its colorful, its easy. thats how its meant to be. wanna talk about boring? how about that iphone and its endless list of app icons and nothing else. at least you can customize this a bit. They said Windows would never catch up to IOS or Android... They were wrong. Now im kinda interested. Its stable as ios and is less restrictive than ios. AWESOME .. this O.S will definitely dominates the race between android and iOS, even though it looks like boring User interface or whatever. the uniqueness and speed of the system will surely the way and the key to success of this operating system. the best thing to me is the compatibility with windows 7 programs/applications. talk about your "app store" just having that ability alone would be reason to get this on a tablet...not to mention from the looks of it true multitasking combined with a full file manager...I mean I can go on but its obvious this is windows with a touch interface placed on it and thats what I really want in a tablet. The ultimate productivity tool. It's nice to see them setting hardware requirements for their system. That was always the bane of PC owners....sh*tty hardware!!! this is just a glorified application launcher... how are you people even managing to excite yourselves over this?? I will only buy it if it has the capability to use the office suite to its full, no cut down versions please. If it has that I will buy the Asus Transformer 2... the perfect Uni laptop/tablet.